Displaying 1 - 41 of 41 items found. Shadow applique results in a soft, smooth look in this basket of fabric flowers. Framed size of wall quilt is 14" x 14". Start stitching this free wall quilt pattern today to bring the joy of gardening into your home, no matter what time of year it is. This would make a great gift for the gardener in your life! Quilt Size: 24" x 24". Quilt Size: 24" x 24"; Sunbonnet Sue applique design. This coaster set includes curved pieces and some simple machine applique for a fun set. Finished Coaster Size: 5" diameter. Block Size: 4 1/2" diameter. Scrappy Log Cabin blocks set in the Barn Raising pattern with appliqued posies make up this summery-looking quilt. Finished Quilt Size: 33" x 33". Block Size: 7" x 7". Show your love of country with this scrap quilt. Red, white and blue fabrics combine to make this free quilting pattern patriotic -- and perfect for your wall. Make this applique quilt for yourself or for a friend with a family member in the military. They'll love it! Quilt Size: 34" x 38". Add a bumper crop of apples & pears to this candle mat for an appealing natural theme. Size: 19" x 13 1/2". Decorate for the Christmas holiday in your own handmade style. 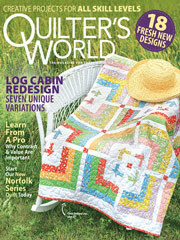 This free quilting pattern features an appliqued tree skirt. Extra layers of batting give this skirt a heavier chenille look. Finished tree-skirt is 44" in diameter. Quilt Size: 31" x 35"; Appliqued Thanksgiving design. Quilt a springtime scene that will make you smile year-round. This free quilting pattern for a wall quilt features flowers and butterflies in a design that's reminiscent of a stained glass window. Combine piecing and applique techniques to complete this happy, handmade piece of art! Quilt Size: 21" x 36". A free quilting pattern featuring heart and checkerboard quilt blocks is perfect for Christmas -- or any time of the year! Quick to piece and easy enough for a child to complete, this wall quilt design would make a lovely friendship gift. Appliquéd Tree blocks combine with pieced House blocks to make this country quilt. Quilt Size: 40" x 50". Subtle and classic, this free quilting pattern for a table topper perfectly shows off its appliqued holly leaf motif. Pair it with a pretty candle or a bouquet and you have a beautiful centerpiece for your table. Plus, it's easy enough for a beginner. Finished Quilt Size: 40" x 40". This happy quilt is sure to brighten up any room, whether spread on a bed or draped over a sofa. Download this free quilting pattern and start stitching it today. Appliqued-and-pieced blocks combine to create this flowery bed-size quilt. Quilt Size: 87" x 100 1/2". If you like the pieced patchwork look but really prefer to applique, make these pillows using triangles and squares. They look pieced, but they are really appliqued! Finished Pillow Size: 14" x 14". Fill a pieced basket with appliqued flowers to make a unique topper to brighten up any room. Topper Size: 25 1/2" x 15". Machine-applique a bright flower-design pillow. Finished Pillow Size: 14" x 14". Size: 12" x 18"; appliqued turkey and pumpkin. This pretty quilt combines piecing and applique. Quilt Size: 30" x 36"
A beautiful homespun look in simple Four-Patch and Nine-Patch blocks with appliqued stars. Quilt Size: 68" x 82". Appliquéd flowers and a pieced background create an interesting design on this corded pillow. Pillow Size: 17" x 17". Narrow strips create the Log-Cabin background to showcase the pumpkin appliques. Quilt Size: 14" x 16". Size: 32" x 32". Block Size: 6" x 6". Use fleece fabric, blind-stitch applique and trapunto -- a "stuffed" technique -- to make a pillow. Create trails of red, green and white hearts when you stitch this free quilting pattern. You could also make this lovely accent pillow as a gift for someone that you love! Finished pillow size is 20" x 20".